Geronimo Stilton has taken the world by storm! Funny and adventurous stories with colourful, engaging text design from the UK publishers who brought you Diary of a Wimpy Kid. 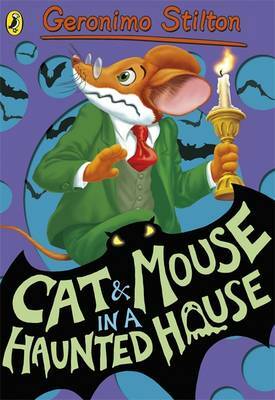 Perfect for both avid and reluctant readers of 5+ Cat and Mouse in a Haunted House Geronimo Stilton is lost in a dark and spooky forest. He thinks his luck has turned when he finds an abandoned mansion to shelter in. But he's not as alone as he'd hoped: the house is haunted - by cats! Can Geronimo escape in one piece or has his luck run out? *Over 75 million copies sold* *Also available in audio* Geronimo Stilton is the publisher of The Rodent's Gazette, Mouse Island's most famouse newspaper. In his spare time, Mr. Stilton enjoys collecting antique cheese rinds, playing golf, and telling stories to his nephew Benjamin. He lives in New Mouse City, Mouse Island.